“Yonie, being happy is not just for the month of Adar, when Adar comes you just increase your happiness but really you should be happy the whole year round and greet everyone with happiness and smile at him”, Yoni’s father explained. Rabbi Rosenstein said he was trying to figure out where he knew this young man from but he couldn’t remember. He was sure the student knew him from before and that’s why the student greeted him so nicely. But a minute later another student greeted him similarly with a great smile asking him if his meals and sleeping arrangements were set up. 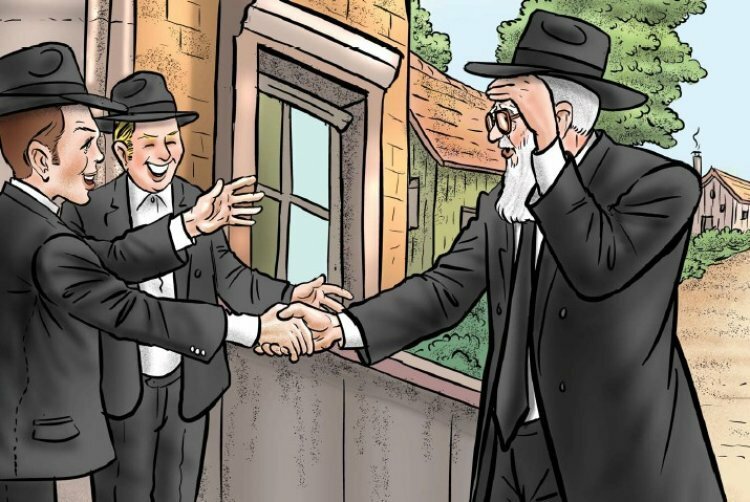 Again Rabbi Moshe couldn’t figure out where he met this student before to be greeted so nicely. Then a third student came over and then a fourth student came over… “What came over me? I don’t remember any of my childhood friends”, thought Rabbi Moshe. In a short amount of time Rabbi Moshe figured out that this is the way they do things in Kelm. They’re always happy and the greet people happily as if they knew them for years! “Daddy I wish I could go to that Yeshiva where they greet everyone nicely!” Yonie said.